Enabling and managing any device on your network is now easier for IT and users using CyberHound’s unique Bring Your Own Device (BYOD) suite of tools. This includes automatic HTTPS certificate inspection, with a simple user installation process. 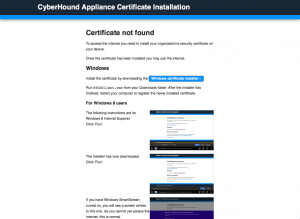 The CyberHound platform will automatically detect if a user has a valid security certificate installed and if not, they will automatically be prompted to install it, without any involvement from IT personnel. 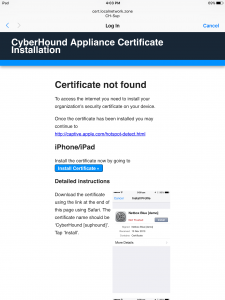 The first time the user attempts to access the internet they will automatically get redirected for HTTPS certificate inspection, (for technical reasons with the TLS protocol, this redirection will occur when accessing a HTTP site via the CyberHound Appliance transparent proxy service only). 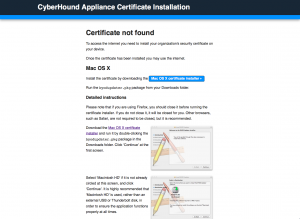 The CyberHound Appliance will then perform a check for the SSL certificate. If the user has the certificate installed then they will be redirected to the internet automatically. No additional interaction will be required by the user or by technical support. If the user does not have the certificate installed (as will typically be the case for a network with new BYO devices), then the user will be prompted to go through the installation process for their specific device. Provided below are some screen shots demonstrating the typical user experience, by displaying the types of installation instructions that a user may be presented with.